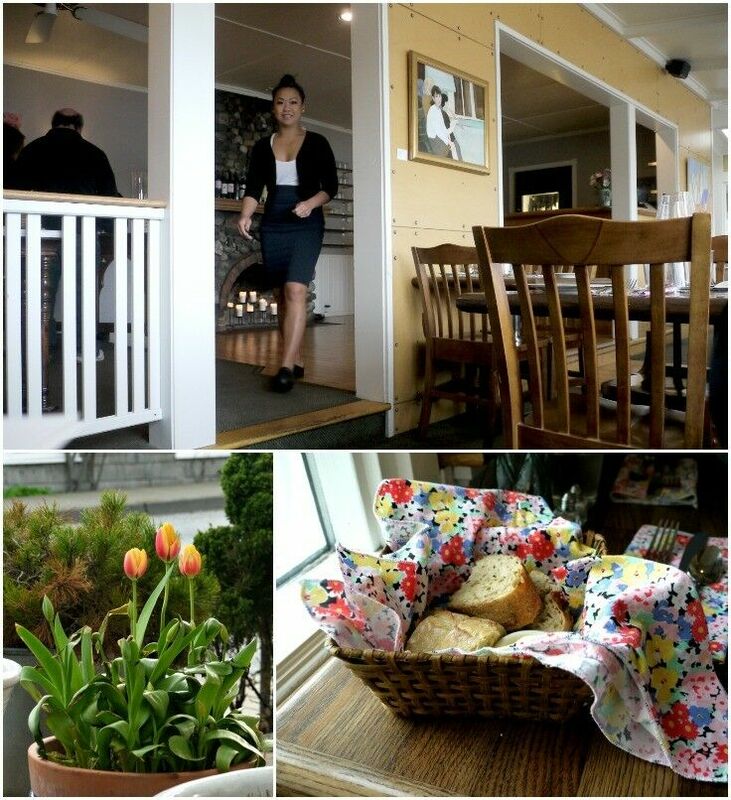 In my last post, I share our experience and thoughts about our dining experience at the New Leaf Café on Orcas Island. Today, I’d like to tell you a little about the man behind the food. When Seattle native Chef Steve Debaste was hired on in 2010 as Chef at the New Leaf Café, he already had quite an impressive resume. 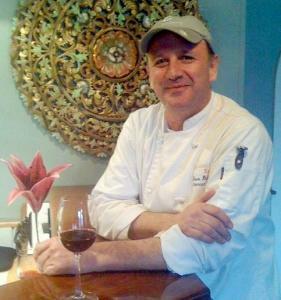 Chef Debaste began his career as the Chef at the Creperie de Touraine in Honolulu. After some years, he returned to Seattle, where his positions included Chef of the nationally recognized 1904 Restaurant and Wine Bar, District and Executive Chef at Microsoft, and Executive Chef for Guckenheimer. He was recognized as the Pacific Northwest Chef of the Year in 2006. Halibut season begins in early May in the Pacific Northwest. 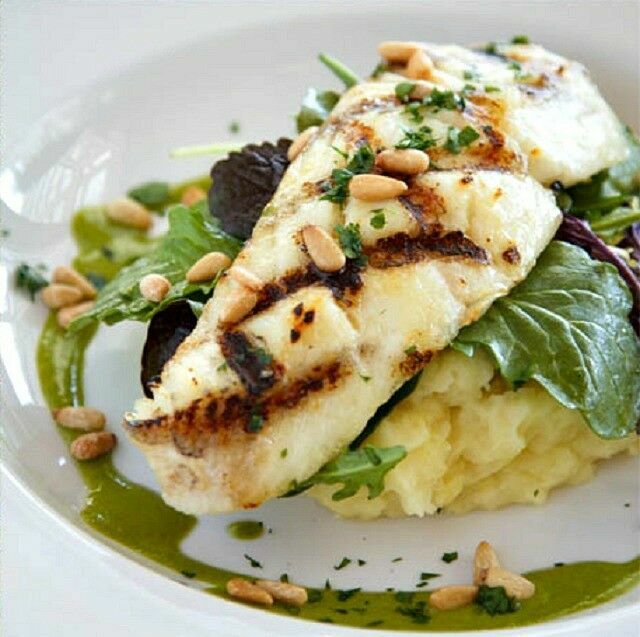 Not only is halibut a delicious fish to eat, but it provides many health benefits as well. A 6-ounce halibut fillet as a good source of omega-3 fatty acids, and is loaded with phosphorus, magnesium, niacin, selenium and vitamins B6 and B12. Season the Halibut with Salt and Pepper and Grill until your desired doneness. Gently toss the salad greens in enough vinaigrette to coat the greens. Plate 1 cup of mashed potatoes in the center of your dinner plate. 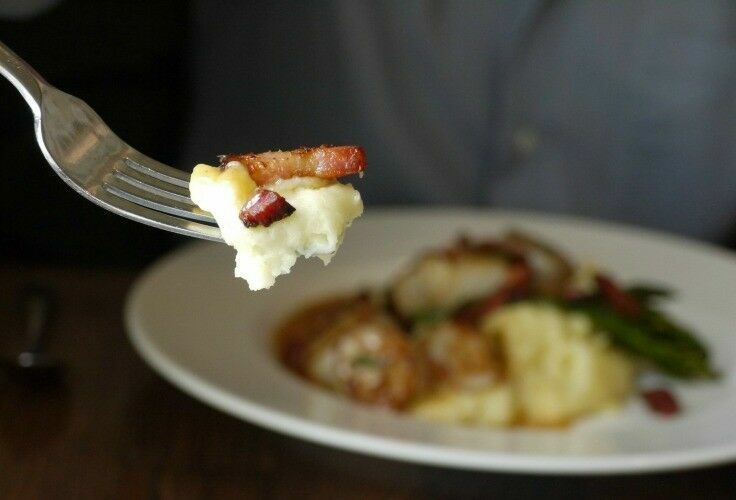 Place the dressed greens on the mashed potatoes. Place the Grilled Halibut on the Salad greens and brush with melted butter. Garnish the plate with a circle of vinaigrette around the potatoes. 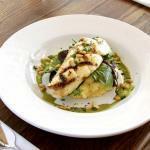 Garnish the Halibut with pine nuts and chopped parsley. Serve immediately. Verjus is a tart, fresh non-alcoholic juice pressed from unripe wine grapes – essentially a very young white wine without the alcohol. Verjus, which takes its name from the French term vert jus, which literally means “green juice,” is a culinary ingredient most often used in sauce making. Verjus is available in gourmet food stores, or directly from producers. If you don’t happen to have any verjus sitting around your kitchen, try using a very astringent white wine. You may be asking, is there a substitute for white truffle oil? Not really, but if you don’t have any and don’t want to pop for a bottle (its expensive!) you can use a fresh and flavorful extra virgin olive oil. To achieve the musty mushroom flavor that truffle oil imparts, you can also use a little truffle salt in place of regular salt when you season the dish. Truffle salt can be made at home by pulsing together a little porcini mushroom powder (or any dried mushroom from the store) and salt. 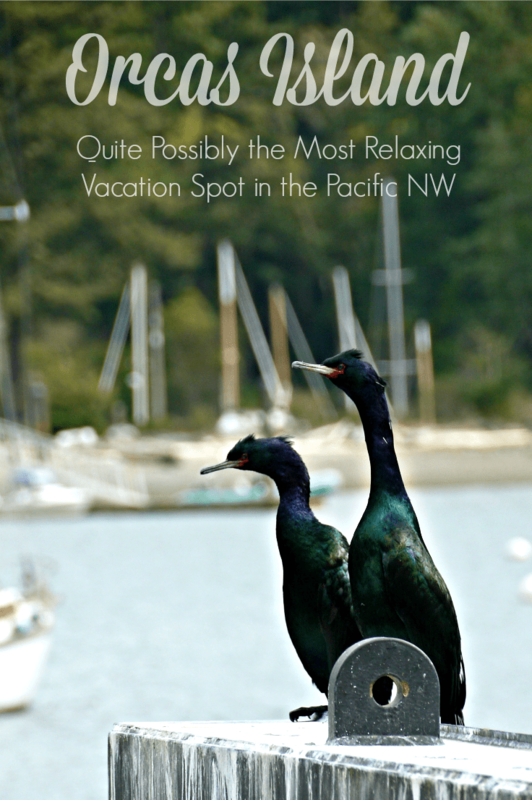 Planning a trip to Orcas Island? 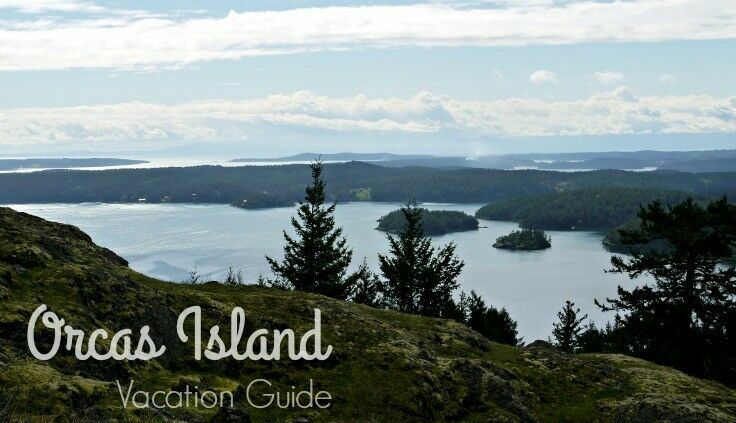 Be sure to check out my Orcas Island Vacation Guide! 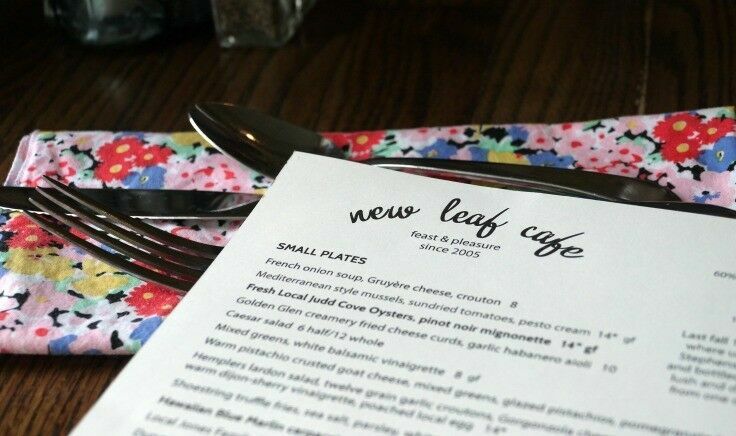 The New Leaf Café on Orcas Island offers guests an exceptional menu and unpretentious elegance. Everyone told us the New Leaf Café was the place for fine dining on Orcas Island, but I have to tell the truth here: we almost didn’t go. Located in the historic Outlook Inn on the Eastsound waterfront, it just sounded a little too-too, as my mom used to say – too fancy, too spendy, too indulgent – for our laid-back, vacation-minded inclinations. However, after talking it through, Mr B and I decided that, as usual, we’d like to make our own assessment. Plus, we heard the crab cakes were to die for. We could not have been happier that we followed our instincts. The atmosphere at the New Leaf Café is one of relaxed refinement, very much in keeping with Pacific Northwest sensibilities. Service was prompt and welcoming, and our waitress very capably toed the line between staying available to attend to any need that arose, while keeping enough distance so that we could enjoy our meal with a certain level of peace and privacy. (Anyone who has ever waited tables, myself included, will tell you that this is a true art.) As for those reportedly too-spendy prices; we found the menu prices very reasonable. The New Leaf Café menu – built on a strong foundation of locally sourced ingredients – is a testament to Chef Steve Debaste’s culinary ingenuity and his dedication to unpretentious elegance. Our dinner started out with a basket of warm, freshly-made breads. 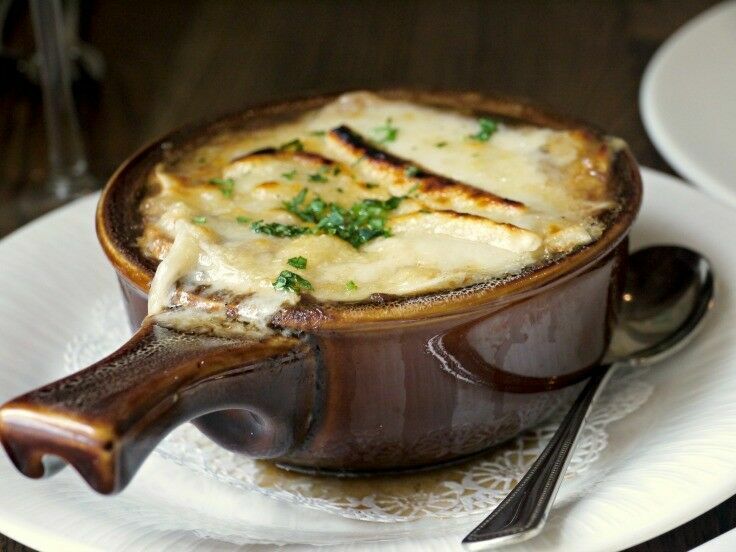 From the small plates menu, we shared a bowl of Chef Debaste’s rich, robust French onion soup. Thick with soft, caramelly onions, our soup arrived blanketed with a large, toasty French bread crouton and a generous covering of Gruyère cheese. It was as delicious as it looks. 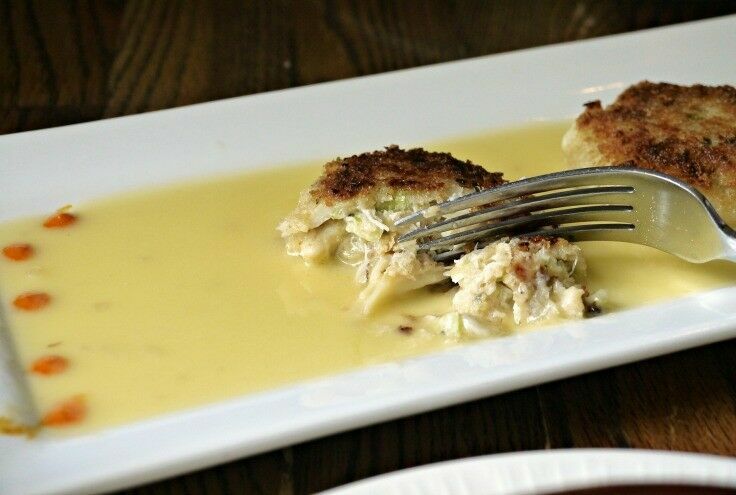 For our main course, there was no mystery about what I was going to order – crab cakes are one of my favorite things in life, and the New Leaf’s dungeness crab cakes did not disappoint. (Technically a small plate, two crab cakes proved more than enough for a meal for me.) 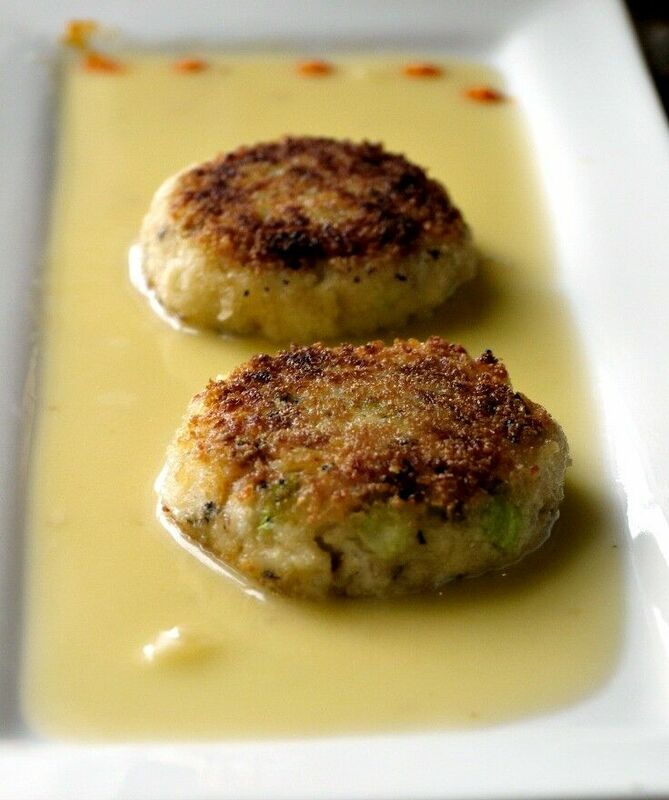 Plated over a creamy Local Goods pear-ginger buerre blanc with habaneros cream, these crab cakes were made with just enough breading to hold them together and no more, and were perfectly seasoned. The habaneros cream not only elevated the aesthetic of the plate, but gave the crab cakes a lovely little kick as well. 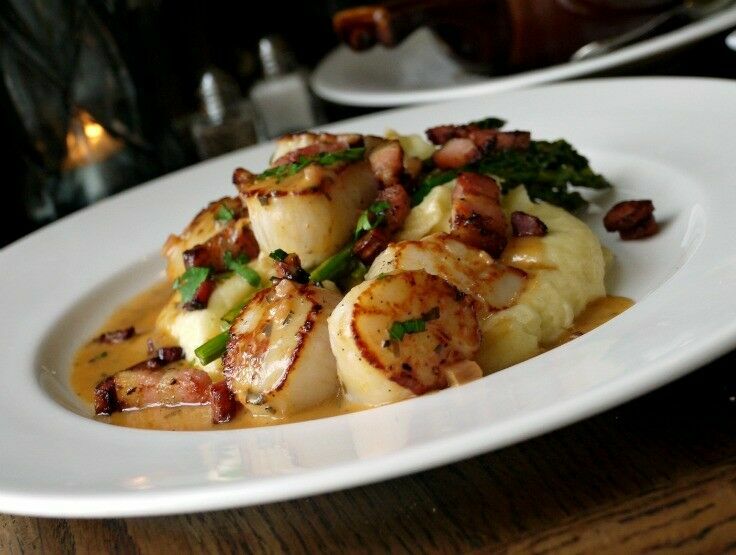 Mr B ordered the pan-seared Alaskan weathervane scallops, which arrived beautifully plated over a warm mash of Yukon Gold potatoes and accented with locally sourced Hemplars bacon. Before I go any farther, it is important you know that I have never been a fan of scallops – they are too “bouncy” for me. However, Mr B encouraged me to have “just a taste.” He said, “Renée, if you are ever going to like scallops, this is the time. These are perfect.” I took a bite, and yes – they were delicious. (To fully appreciate that statement, you can liken it to a three-year old mushroom-hater suddenly declaring that Hungarian Mushroom Soup is his favorite food.) Mr B ate every scallop carefully, closing his eyes often and savoring every bite. He was, by all appearances, in seafood heaven. Likewise, the Yukon Gold mashed potatoes, served with a fresh tarragon buerre blanc and asparagus, were amazing. Overall, I just cannot say enough about the exceptional quality of the food at the New Leaf Café. It more than lived up to its reputation, and we will definitely be visiting again. The New Leaf Café serves a very popular happy hour menu that includes – in addition to drink specials – small plates like duck mac & cheese, warm goat cheese salad, and that amazing French onion soup. The schedule and service [breakfast, brunch, dinner] varies seasonally. Check their website for current hours of operation. The Deer Harbor Inn Restaurant offers Orcas Island diners a locally-sourced menu of slow-food at its best. 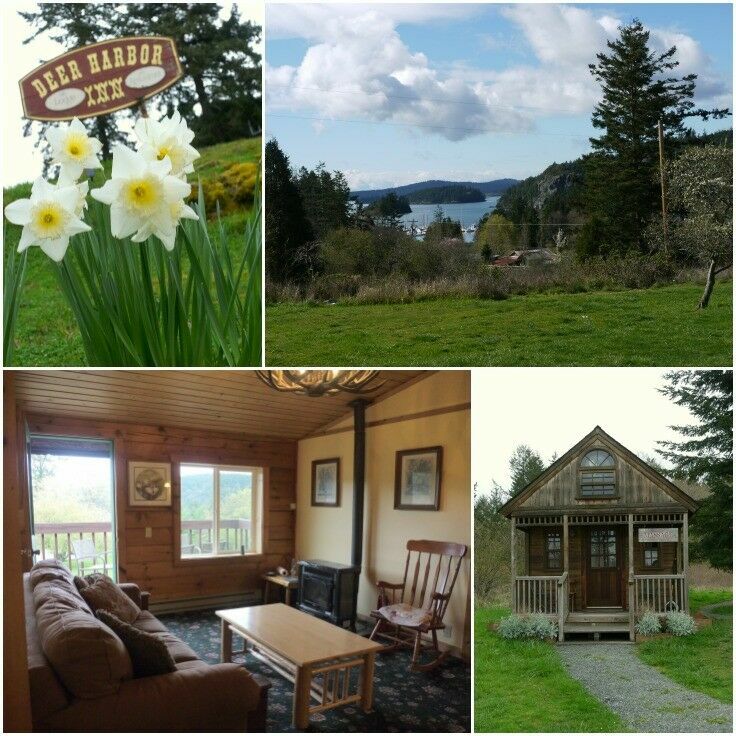 While we were on Orcas Island, we stayed at the Deer Harbor Inn, a small, casual, family-friendly resort (and I use the term very loosely here) that sits on a knoll overlooking the tranquil Harbor and majestic Mountains on the Olympic Peninsula. The Inn has quite an interesting history, including a dance hall that served as the home court for the first basketball team on Orcas. (There is also an intriguing story that involves an unlikely connection between rhubarb and prohibition, which you can read about here. Since 1982, it has been owned and operated by the Carpenter family. 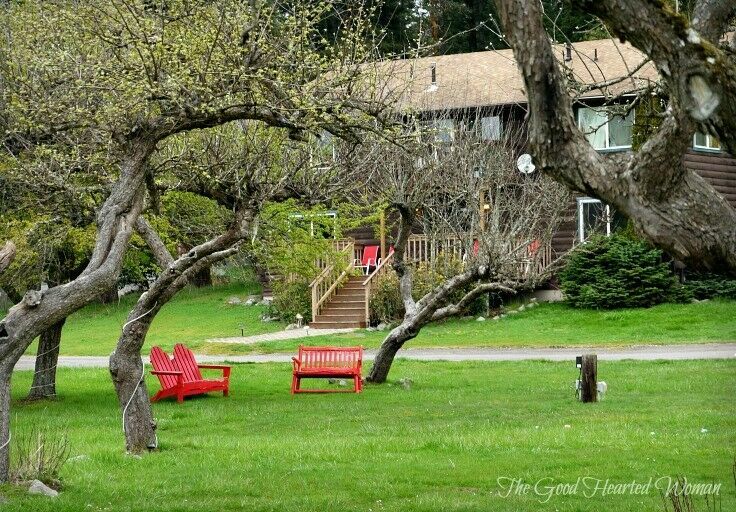 The Inn is built around a central greenspace where families can play games or kick back and relax. The only drawbacks we found to staying in this remote local was that the wifi was sketchy and temperamental, and the phone coverage was almost non-existent, but we quickly learned to adjust. 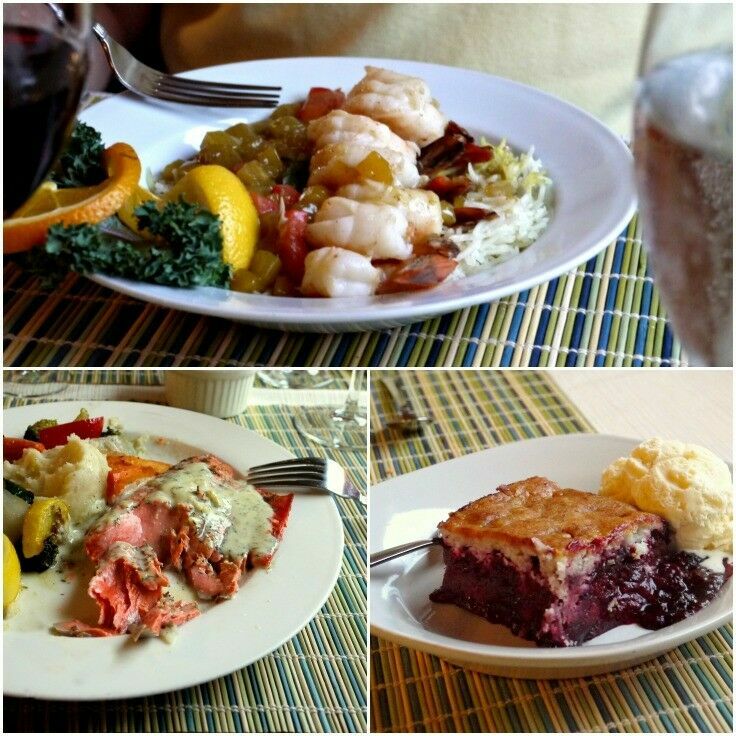 The single most memorable thing about our stay at the Deer Harbor Inn was our meal at the Deer Harbor Inn Restaurant. It was practically perfect in every way. Before I go any farther though, let me set the scene, because I think it had profound influence on our overall experience. As I mentioned in a previous post, because we were on Orcas Island in early spring before the tourist season really gets underway, we practically had the whole island to ourselves, and the restaurant at the Deer Harbor Inn was no exception. During the entire time we were there, there were only two other occupied tables in the whole place. We were also without children, so our time was ours and ours alone. That being said, we spent two and a half hours at the Deer Harbor Inn Restaurant, dining on one of the two best meals we’ve experienced in months. (You can read about the second one next Friday!) It was slow-food at its best. Parenthetically, as the mother of many, there were times in my life when I never even dared to dreamed of a two hour dinner uninterrupted. There is hope, little mamas. 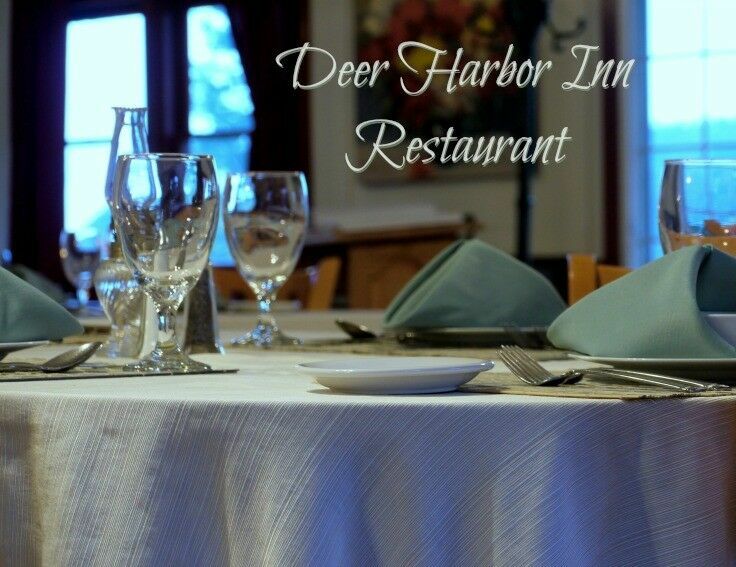 The Deer Harbor Inn Restaurant serves simple, hearty American cuisine, sourcing local produce and proteins from the island whenever possible. 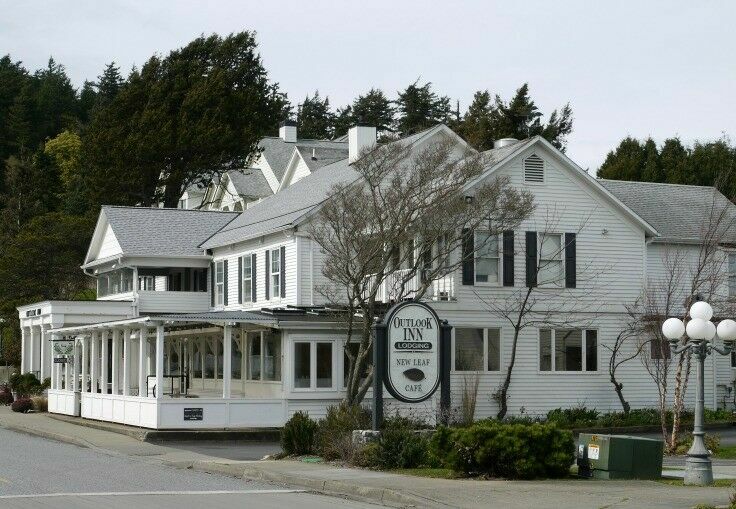 Like the Inn, the Deer Harbor Inn Restaurant is a family affair. In 1998, brothers Matt “Chef” and Ryan Carpenter took over the restaurant and catering operations, bringing a renewed energy and enthusiasm to the Inn’s history. They went on to purchase the restaurant from their parents in 2006. 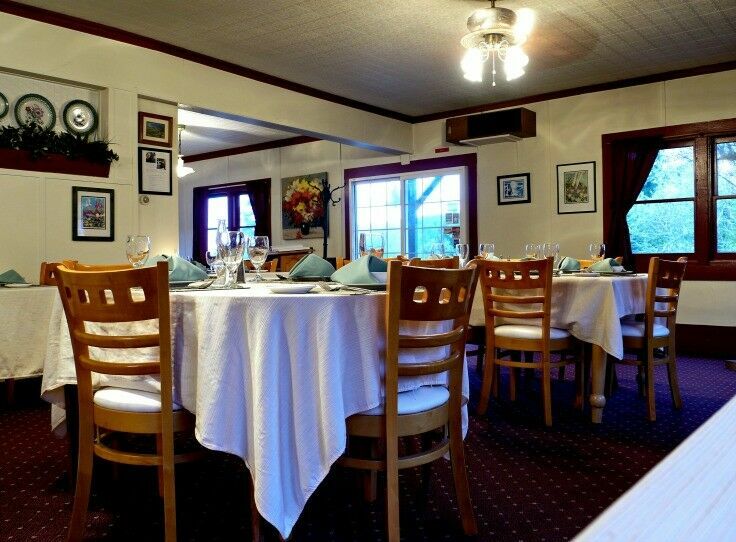 The ambiance at the Deer Harbor Inn Restaurant is comfortably formal (which to Pacific Northwesterners means that you should probably at least wear your good jeans). There is a big, wrap-around porch and patio that is used for outside seating in warmer weather, with a lovely view of Deer Harbor and the Olympic Mountains. When we arrived, we were greeted immediately and guided to a lovely table. Our server was friendly and very attentive. Obviously, we can’t comment on how the service stacks up when the place gets busier, but at least on our visit, we felt like royalty. 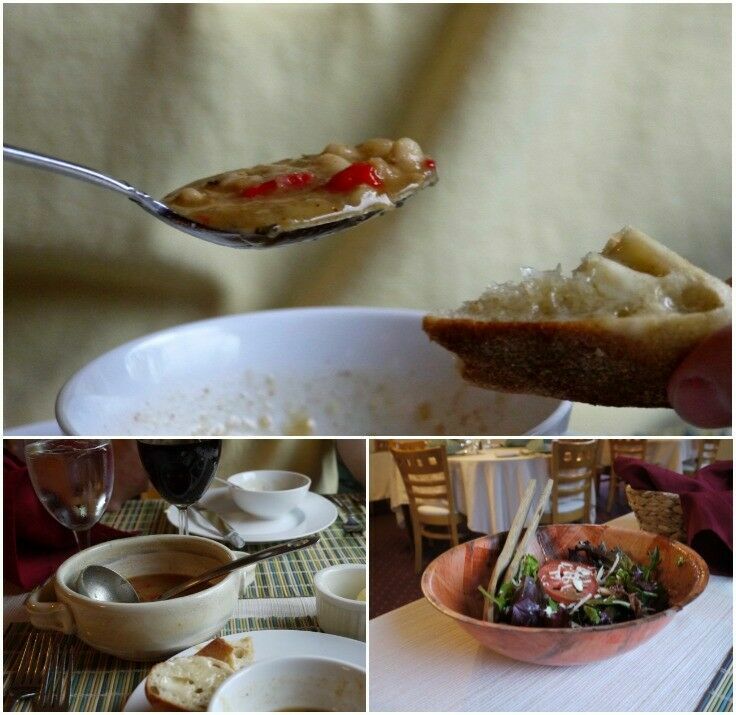 All entrees include homemade soup, garden salad and bread, which are served family style. The navy bean soup that we were serve the night we were there was outstanding; perfectly seasoned, with excellent consistency. The salad, served with a simple balsamic vinaigrette, was a bit pedestrian, but nevertheless fresh and satisfying. I opted for the fresh catch of the day, which proved to be a fabulous choice. 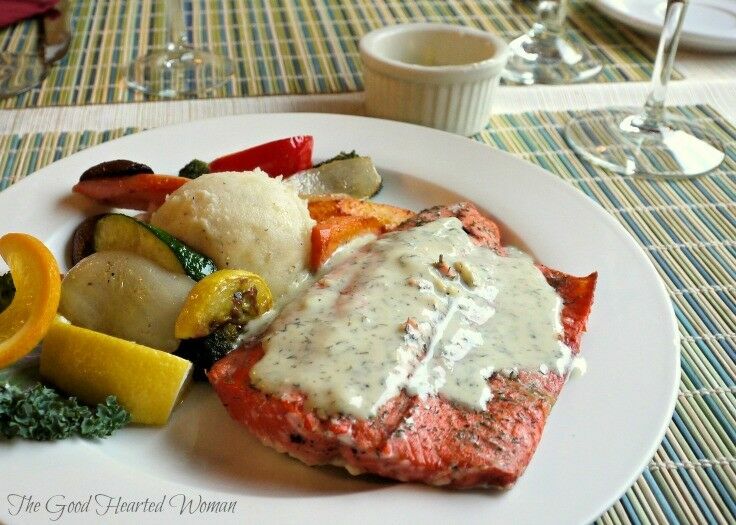 My generous steelhead fillet was served with smooth, delicately savory dill sauce, fresh grilled seasonal vegetables and mashed potatoes. I included not one but two images of my steelhead here because the deep orange color was absolutely beautiful, and the tender, flaky-textured meat was so rich and full-flavored that I would have had a difficult time distinguishing it from Pacific salmon. After such an abundant meal, we had not anticipated ordering dessert, but we couldn’t pass up the warm Marion berry cobbler. Served with a sidecar of vanilla ice cream, it was the perfect finale for our delicious meal. In the final analysis, our dinner at the Deer Harbor Inn Restaurant was (by very slim margin) our favorite meal of the entire week; however, as I mentioned at the beginning of this post, that was highly influenced by a number of factors, the most notable ones being that since we basically had the entire place all to ourselves we could linger over dinner to our hearts content, and best of all – after dinner it was just a two-minute stroll back to our room! For the meal we were served, the price was on the reasonable side of pricey. We had dinner with soup, salad, and bread, plus dessert and two glasses of wine for about $100, not counting tip. If you plan to go during the busy “tourist” season, be sure to make reservations ahead of time. And be advised, during the slow season, the restaurant is open Friday through Sunday only. 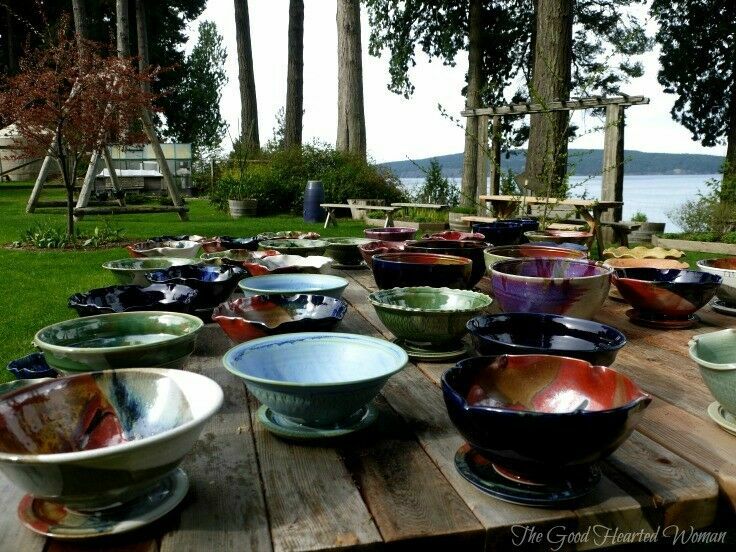 From one generation to the next, through earth and fire, Orcas Island Pottery continues to create and inspire. In my experience, the need for art is one of the strongest connections humans have, both with the past and with one another. About ten years ago, I had the privilege of visiting the Gallery of Chinese Ancient Ceramics at the Shanghai Museum in Shanghai, China. I remember standing just feet from pottery that dated back thousands of years, separated from each piece by only a thin transparent wall. As I peered through the glass, all I could think about was the long-forgotten hands that created those beautiful pieces; and more broadly, about the inborn and seemingly essential human desire to create. I find that last aspect infinitely intriguing; nearly mystical, in fact. It feeds a question that percolates in my brain often: What place does art, and particularly its creation, have in our survival, both as individuals and as cultures? I didn’t set out to get all existential on you, but our visit to Orcas Island Pottery caused me to ponder this question once again. We tend to think of such things – the creation of cultural art and artifacts – in terms of ancient history, as in the Shanghai relics or (more close to home) Pacific Northwest Native American/First Nations artifacts. 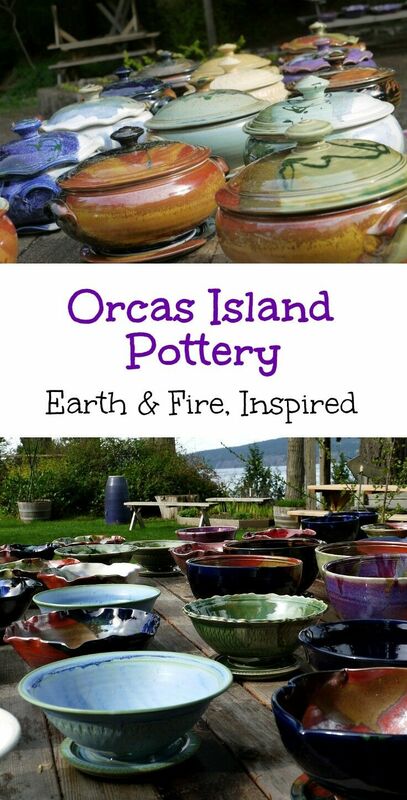 However, in the case of Orcas Island Pottery, that tradition of artisans passing on their wisdom through earth and fire from one generation to the next to create enduring art and artifacts is still burns brightly even today. 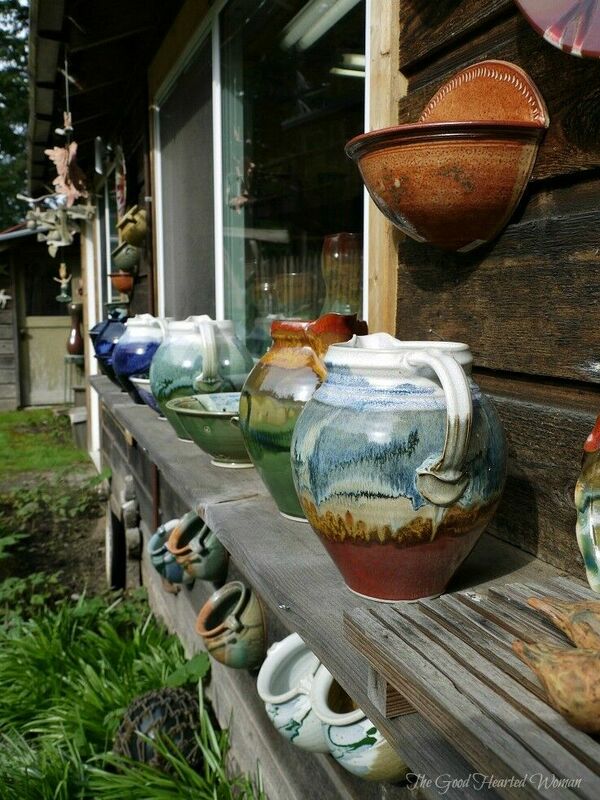 Orcas Island Pottery is the oldest pottery in the Pacific Northwest and one of our favorite places on Orcas Island. 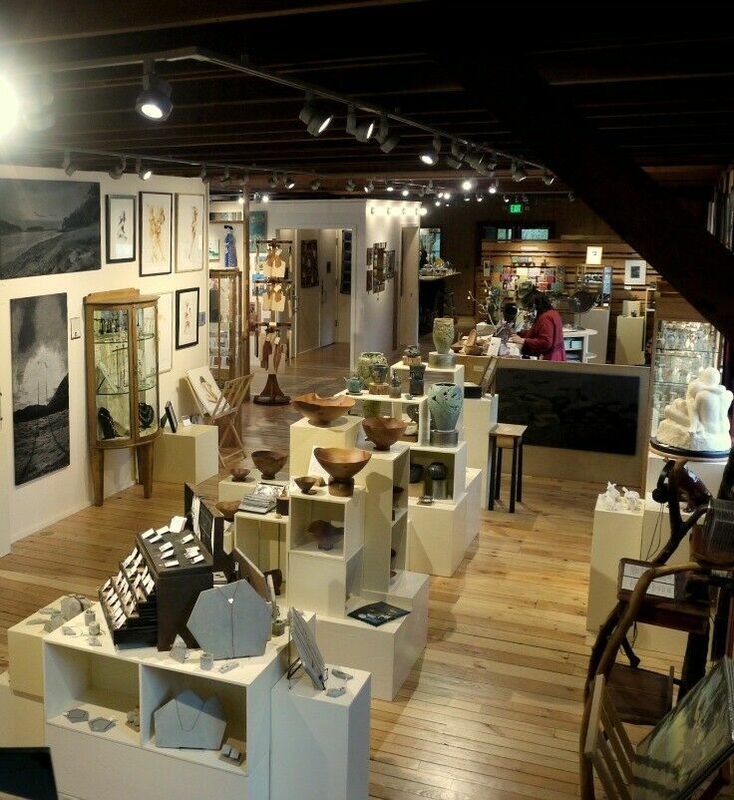 The pottery opened in 1945, when Joe and Marclay Sherman dug their first clay out of the island banks and created the studio and store that visitors have come to know as an island institution. Knowledge passed from grandmother and mother to daughter is intrinsic to the Orcas Island Pottery story, and the aspect that intrigues me the most. In 1953, Julia Crandall bought the pottery from the Shermans, who taught Julia and her daughter Trudy all that they knew. In 1989, Trudy’s daughter, Syd Exton, became the manager and lead potter, and inherited the pottery from her grandmother in 1993. 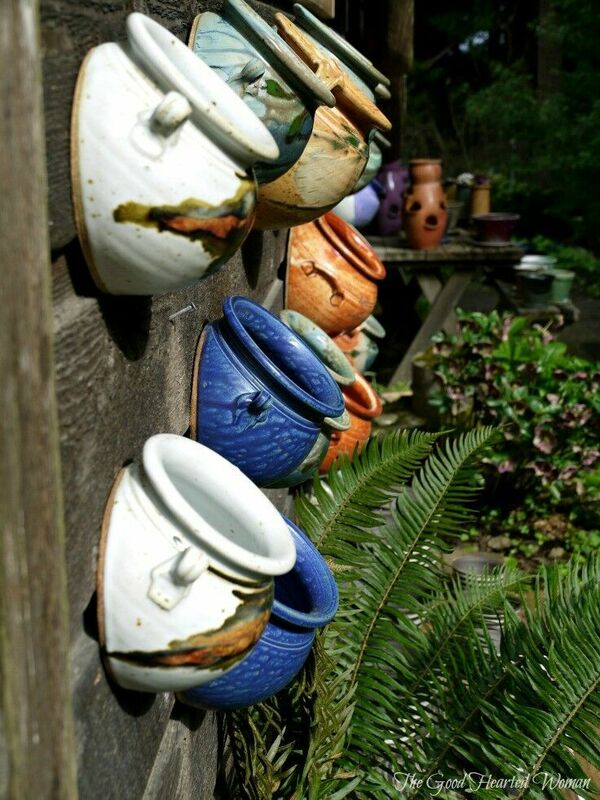 Now some fifteen potters make and display their works at the store. Much of the pottery is displayed outdoors, and the a view across President’s Channel to Waldron Island and beyond, is magnificent. 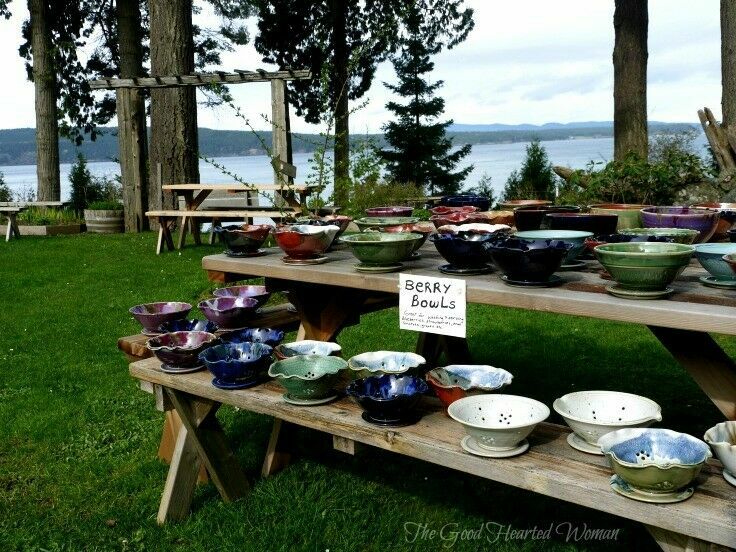 Despite warnings to the contrary, Orcas Island Pottery really isn’t difficult to find at all – just follow the signs. When you come to the last turn, you will find yourself on unpaved road. 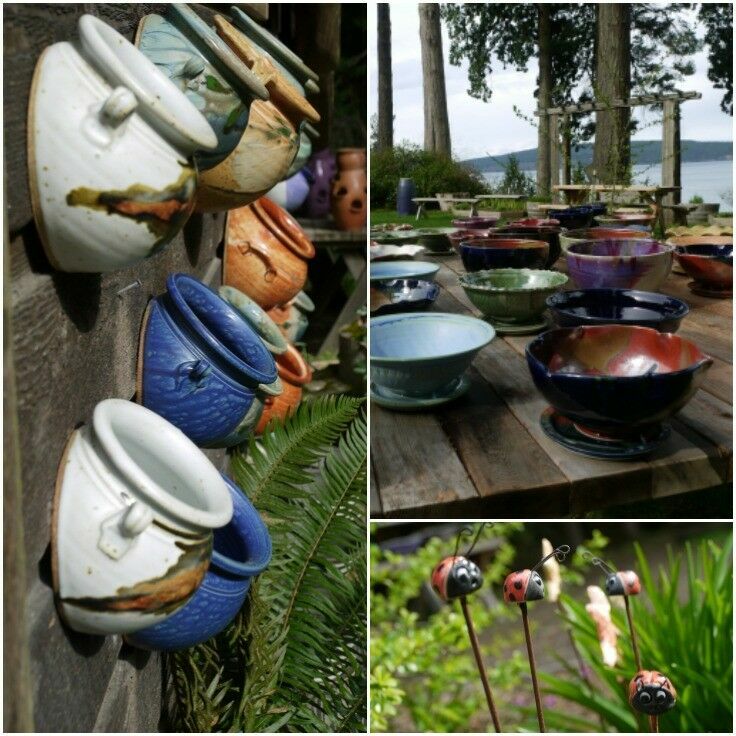 Drive down it (you can’t get lost) until you get to the parking lot, and then take the foot path down through the rough garden arbor and into the yard, where you will immediately find yourself surrounded by some of the most uniquely beautiful pottery in the entire PNW region. There you will find a whimsical pottery garden, complete with fountains, a swing, and a large tree-house for the kids (and kids at heart!). So, why do humans make art? Certainly, in the case of pottery, it is both functional and beautiful, but a plain clay pitcher holds water as well as one with a tricolor glaze. What makes us strive to transcend functionality and reach for something more? I believe that we have an instinctive need to Create Beauty. To make, and to endure in some way through our making. Our art communicates who we are and what is important to us. It tells our story. In these ways, it is as necessary to the endurance of humanity as water. What do you think? Why do we create art? The quiet, remote, revitalizing peace of Orcas Island in the springtime may just be one of the island’s best kept secrets. It was the middle of the summer the last time we visited the San Juan islands, and as you might expect, every business was bustling, the farmer’s markets were in full swing, and tourists were everywhere. And while we enjoyed our summer stay on the island enough to want to return, it was our visit this spring that made us want to stay forever (maybe, someday!). Early spring is an extension of the winter slow season on Orcas (“the Rock” in local lingo), and so much of the time, we felt as though we had the whole island to ourselves. During our time on Orcas Island, we stayed at the Deer Harbor Inn (which we will be posting about in detail later this week). Once we had settled into our room in the lodge, we set out to explore. Even in the off-season, there are so many things to see and do on the island that we had no trouble filling our days. 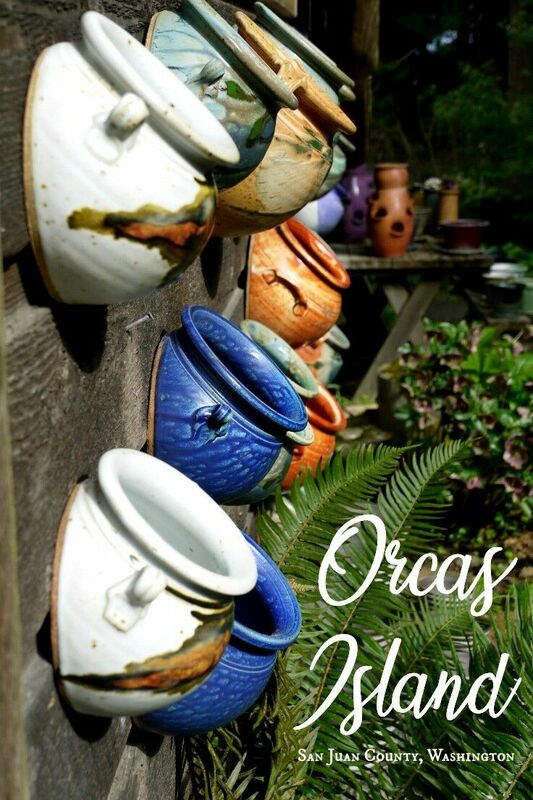 We were excited to return to some of our favorite spots from our previous visit to Orcas, and the first stop on our itinerary was Orcas Island Pottery. The pottery there is so beautiful, and the story so interesting that we have a whole post about it coming up tomorrow, but here’s a little sneak peek. Following our stop at Orcas Island Pottery, we continued on to Eastsound, the largest of the four hamlets on the Orcas Island. 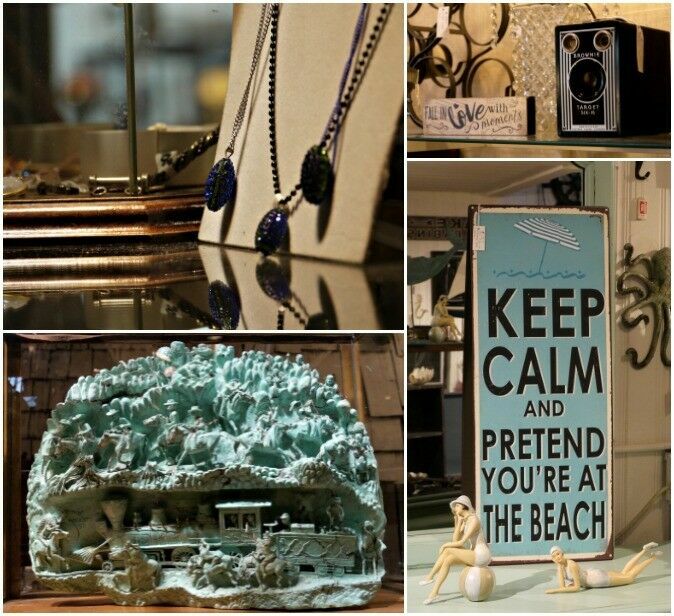 Eastsound is home to a wide variety of charming shops, specialty boutiques, and restaurants. This is also where you can find such things as a bank, pharmacy, grocery stores and public library. 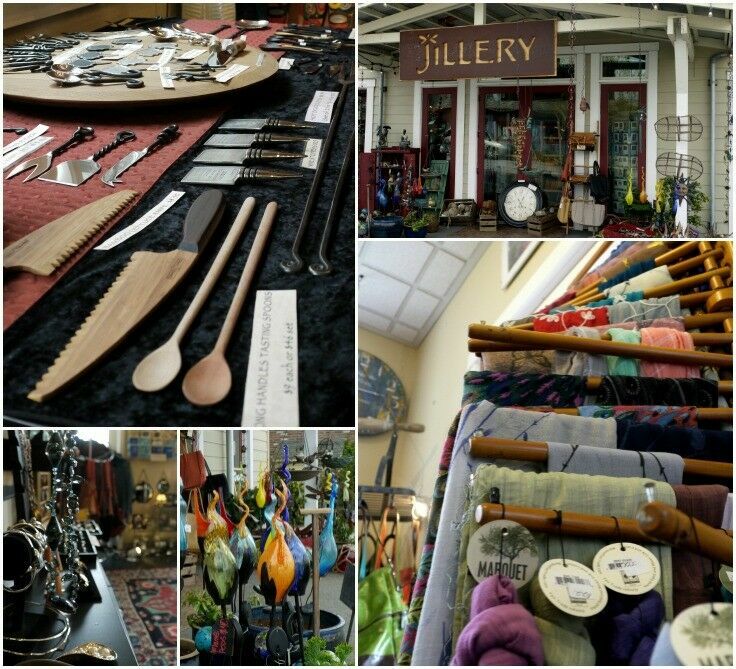 I especially enjoyed our visit to Jillery, a favorite shop for locals and visitors alike. 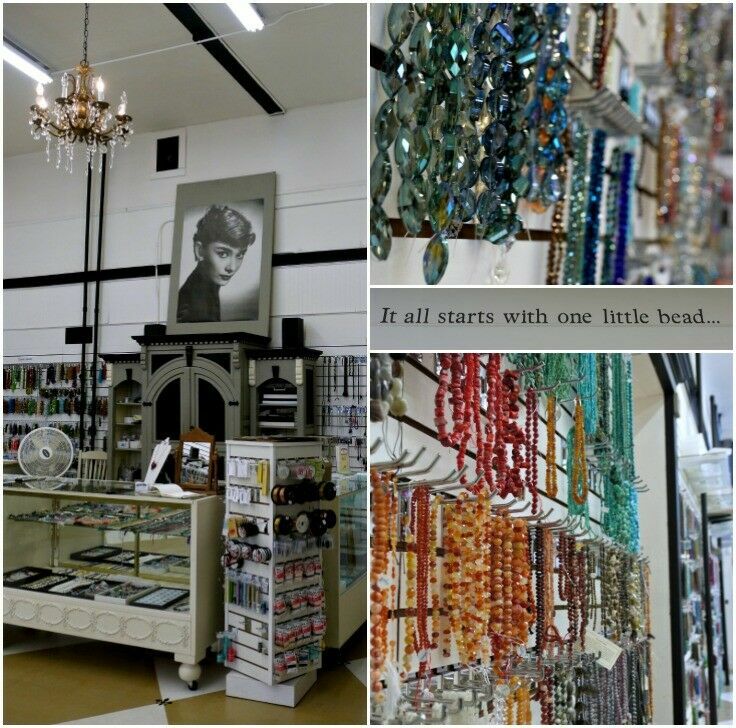 Jillery offers an eclectic mix of artisan-made jewelry, art, and personal, home, and garden accessories. 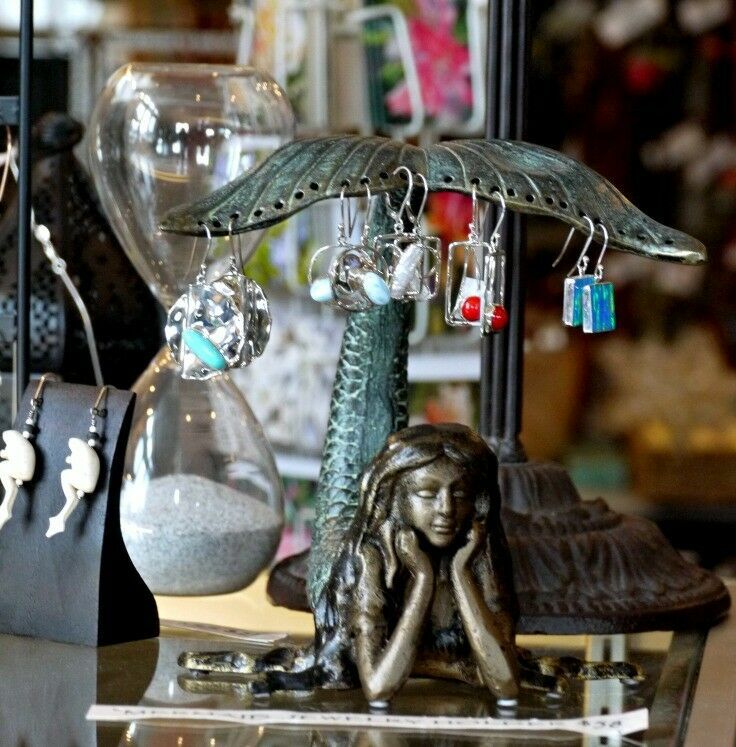 Everyone who knows me knows I have a weakness for long, beautiful earrings (plus I have a thing for mermaids) so it’s no surprise that I fell in love with this mermaid earring holder! No visit to Eastsound is complete without a stop at Katherine Taylor Chocolates. There you will find island-made artisan chocolates, drinking chocolate, Stumptown Espesso, ice cream, and even a soda fountain! There are so many beautiful sights to see on Orcas Island that you really do need to take an old-fashioned drive in the country. You never know who you might run into! 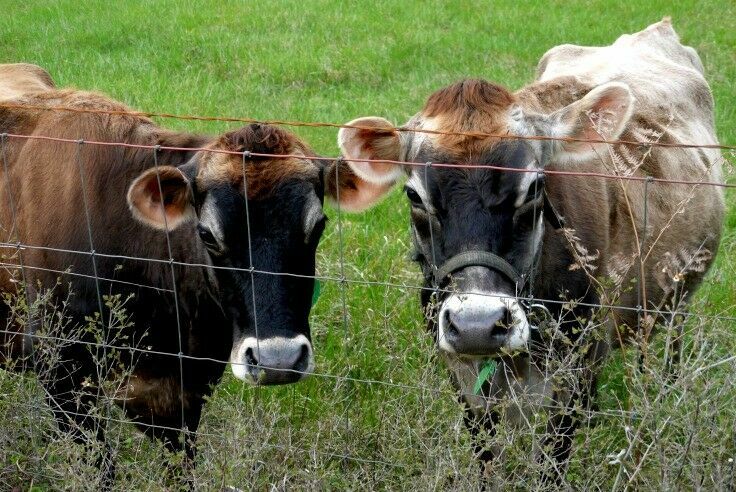 We met these beautiful ladies in while driving in the countryside, and stopped to chat for a few minutes. They’re pretty great listeners. 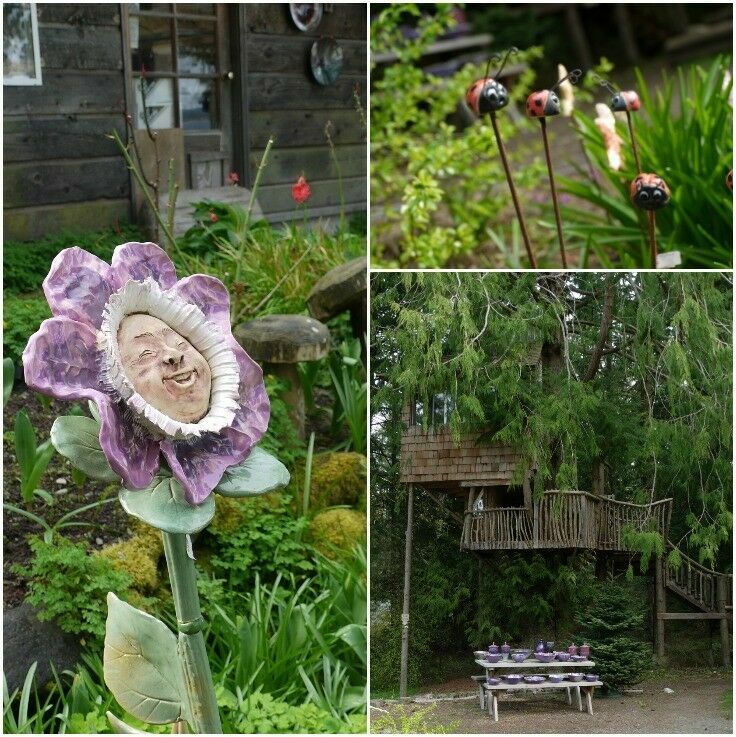 Traveling to the east side of the island, you will find the picturesque hamlet of Olga, and the Orcas Island Artworks, a cooperative gallery. Artworks, which shares space with the Catkin Café (with its all-scratch kitchen! ), and the James Hardman Gallery, is housed in a strawberry barreling plant that dates back to 1938. 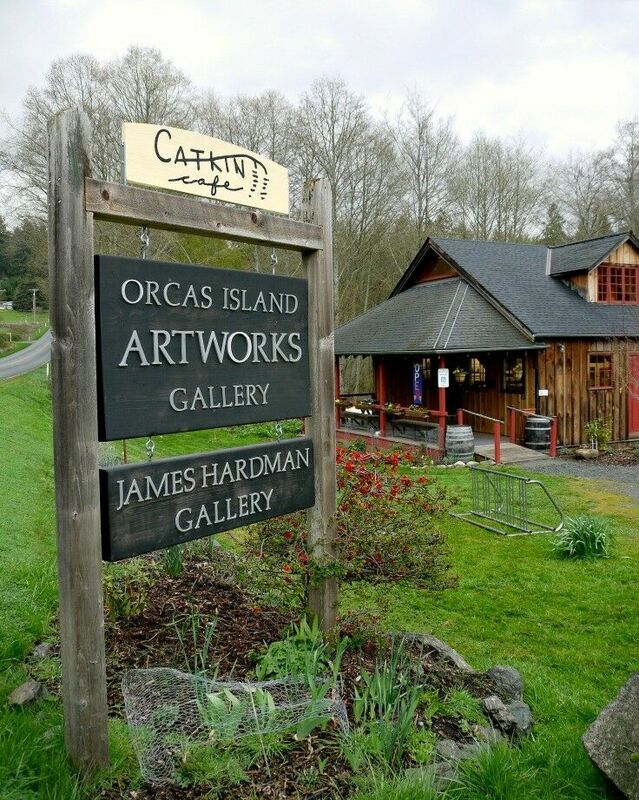 The lovingly restored landmark now showcases an extensive collection of work by Orcas Island artists and craftspeople, the Artworks Gallery offers paintings, prints, jewelry, pottery, sculpture, glass, wood, fiber and wearable arts, as well as other locally made items and gifts. Artworks is owned and operated by the artists themselves, which gives visitors the unique opportunity to meet one or more of them on any given day. 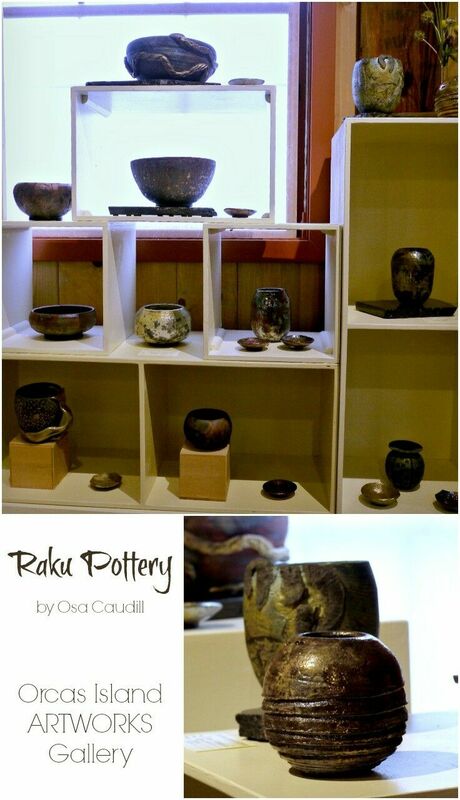 The day we visited, we were fortunate to meet raku artist and potter Osa Caudill. 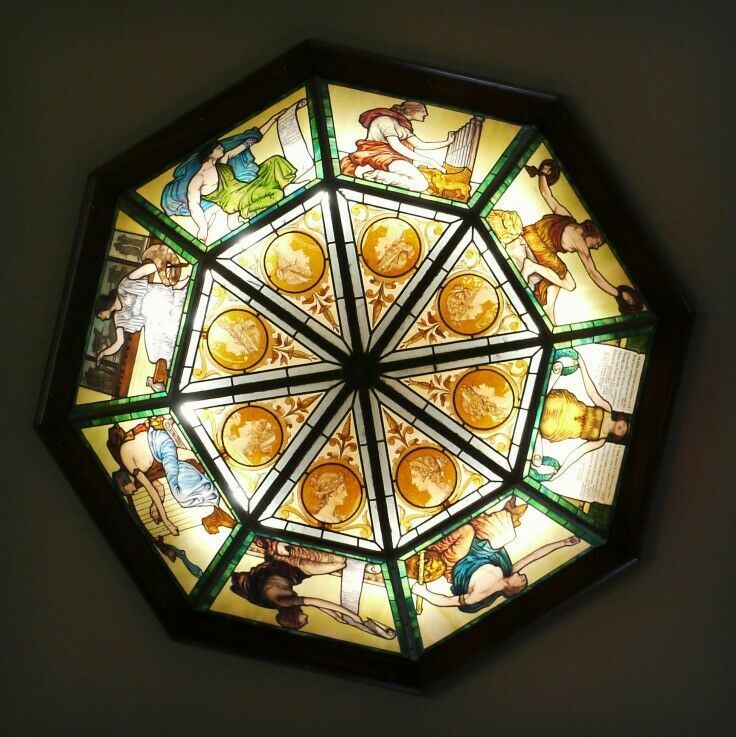 One final stop that we must share: The beautiful Moran Mansion Museum, located on the second floor of the Rosario Resort & Spa. 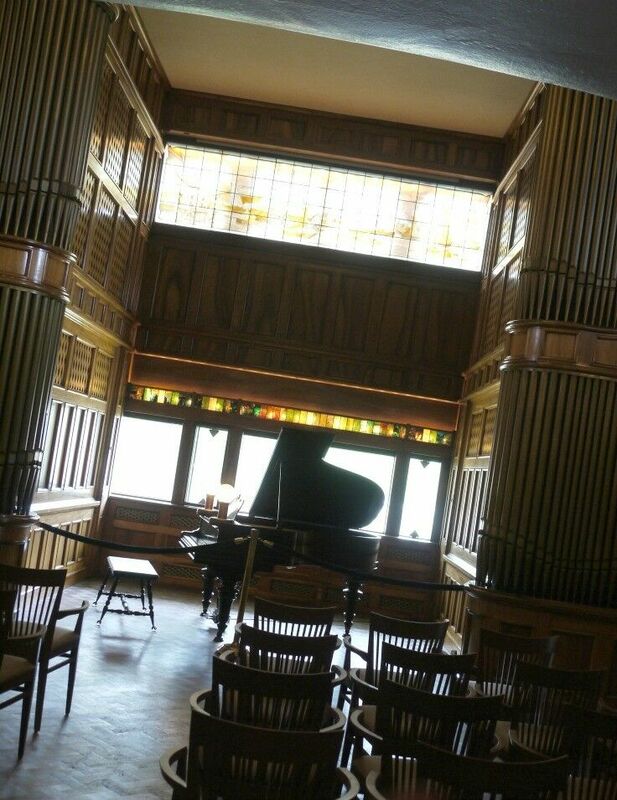 Open daily and free of charge for public viewing, a visit to the Moran Mansion at Rosario is stepping back in time. This beautiful tribute to the Arts & Crafts movement of the early 20th century was built Seattle Shipbuilder and Mayor Robert Moran. The mansion features original photographs from the late 1800’s and early 1900’s, original furnishings and fixtures, and an extensive display of the ships built by the Moran Brothers Company in Seattle. Stay tuned! 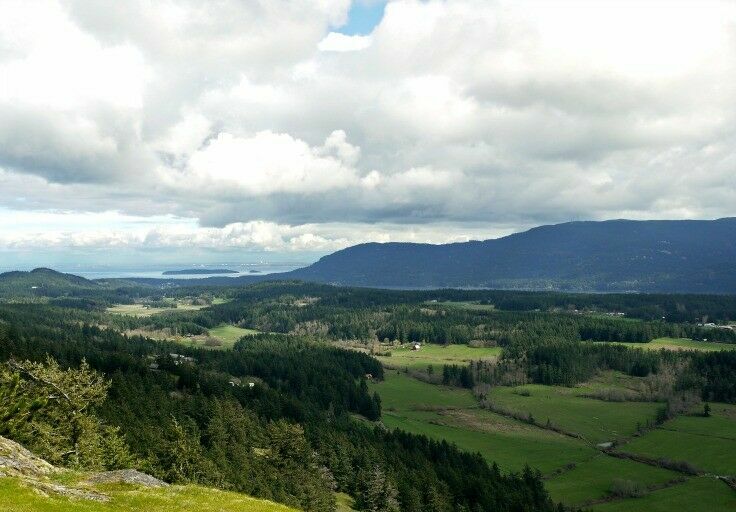 There’s lots more to come about Orcas Island, including an awesome day hike, cheap eats, and [hopefully!] a surprise or two! THANK YOU so much for being a faithful reader and supporter of The Good Hearted Woman. ❤ Please be sure to PIN this post! 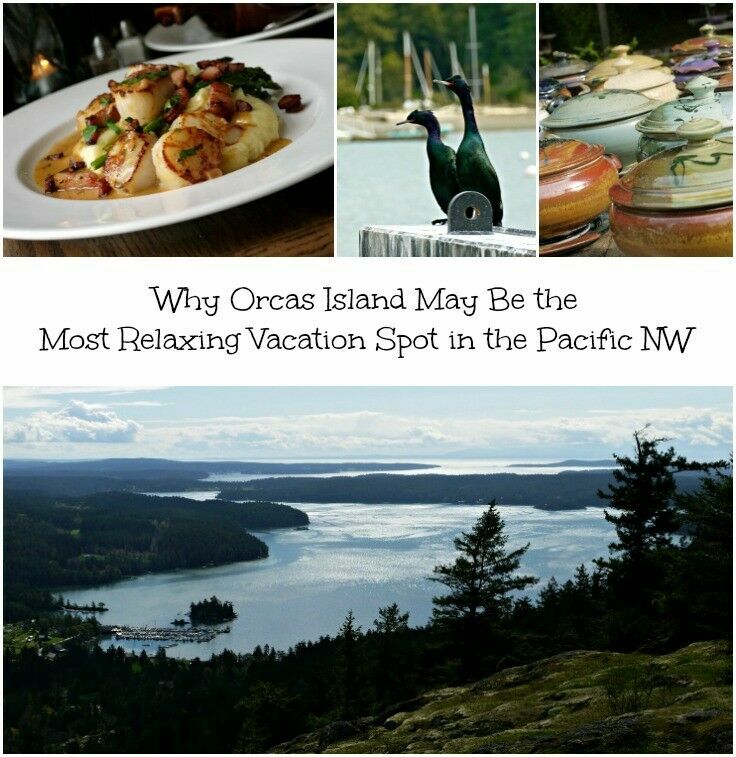 Planning a trip to Orcas Island? 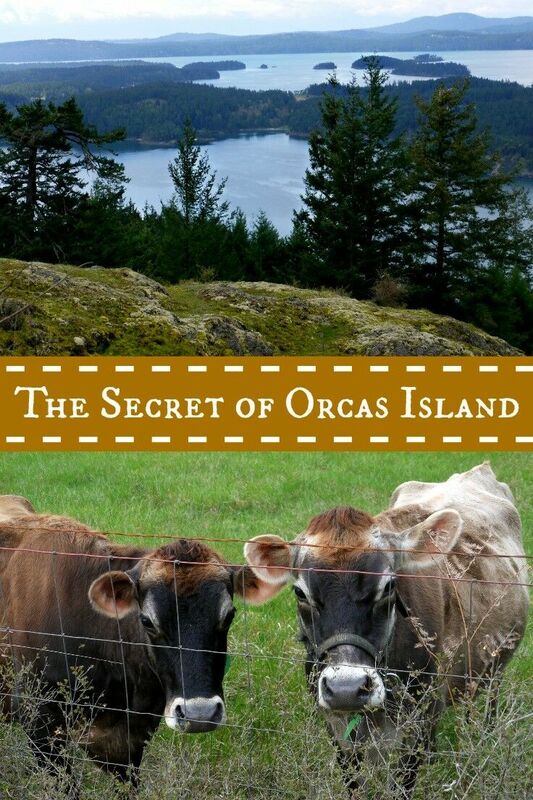 Be sure to check out our Orcas Island Vacation Guide! 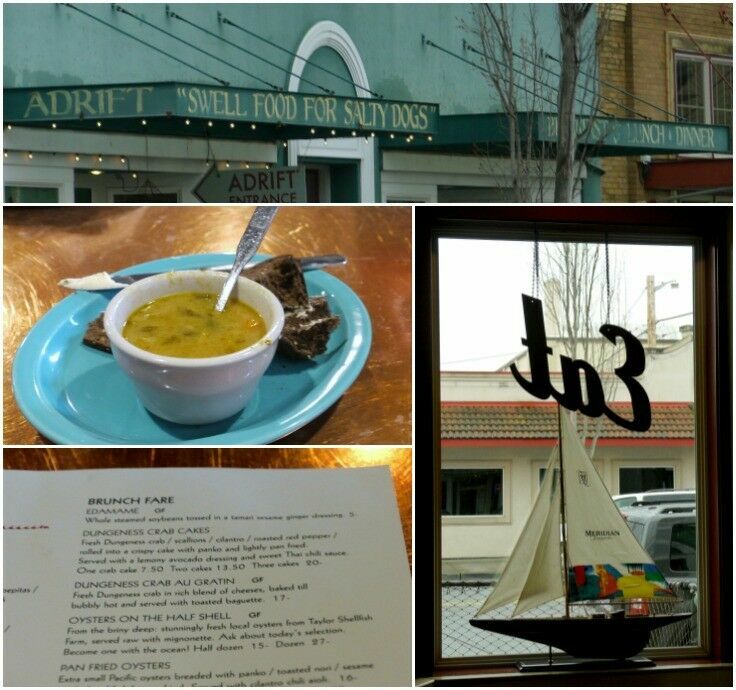 A visit to Historic Downtown Anacortes is a great start to an Orcas Island vacation. There are several ways to get to Orcas Island and the rest of the beautiful San Juan Islands. Visitors can go by private boat, airplane, or seaplane, depending on the season; however, most people take a Washington State Ferry departing out of Anacortes, Washington. No matter how you get here, the scenery is spectacular and getting here is half the fun! 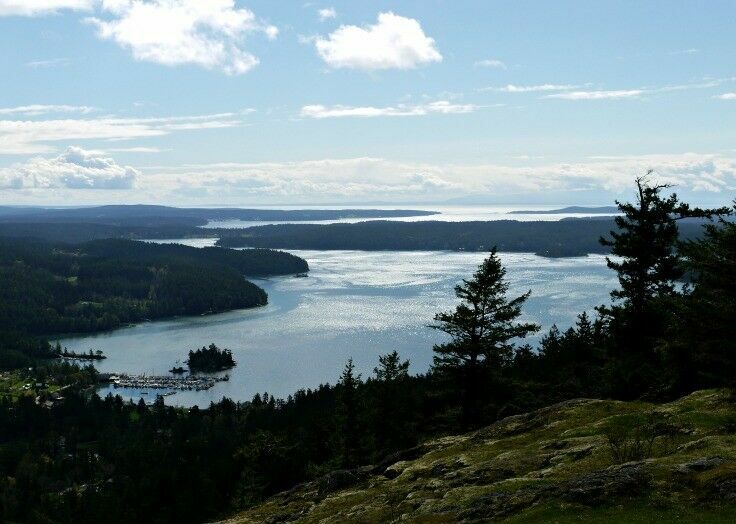 Anacortes is located on Fidalgo Island, the most accessible island in the San Juan archipelago, with easy access via bridge from the mainland. Remember, if you are driving from points south that you will have to brave the unpredictable Seattle traffic to get there. It’s roughly a four and a half hour drive from Portland with clear roads, so be sure to give yourself extra time if you are making both car and ferry trip in one day. Mr B and I had no desire to stress ourselves out at the beginning of our getaway, so we drove north and stayed the night in Mt. Vernon, a small farming community about thirty minutes outside of Anacortes. That way, we didn’t have to worry about rushing to the ferry, plus it gave us the chance to stroll through Historic Downtown Anacortes before lining up at the ferry dock. Take a stroll down Commercial Avenue or the nearby waterfront and one of the first things you will notice is an abundance of colorful life-size murals on the sides of buildings all over town. These murals aren’t painted directly onto the buildings, but rather are wood cutouts attached to the walls. 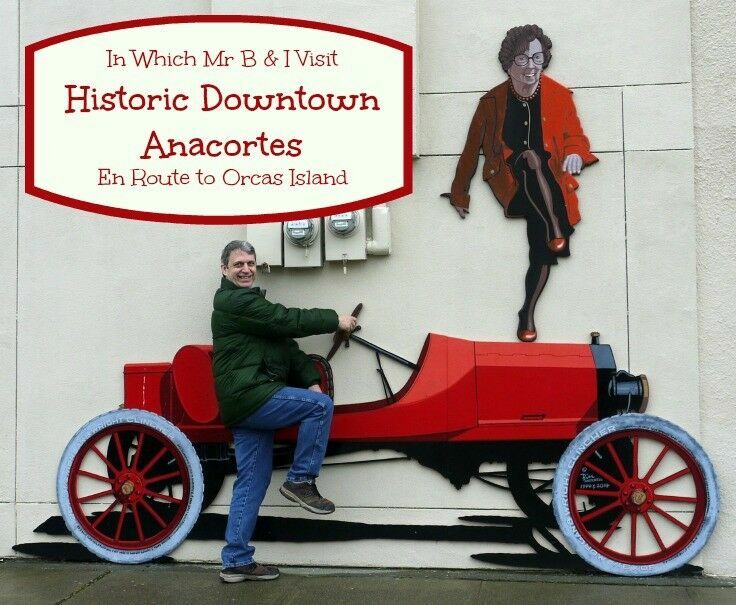 Based on photographs depicting life in early Anacortes history, they include a wildly diverse group of local characters, including musicians, shopkeepers, sports heroes, brewmasters, mail carriers, gas jockeys, and train conductors. 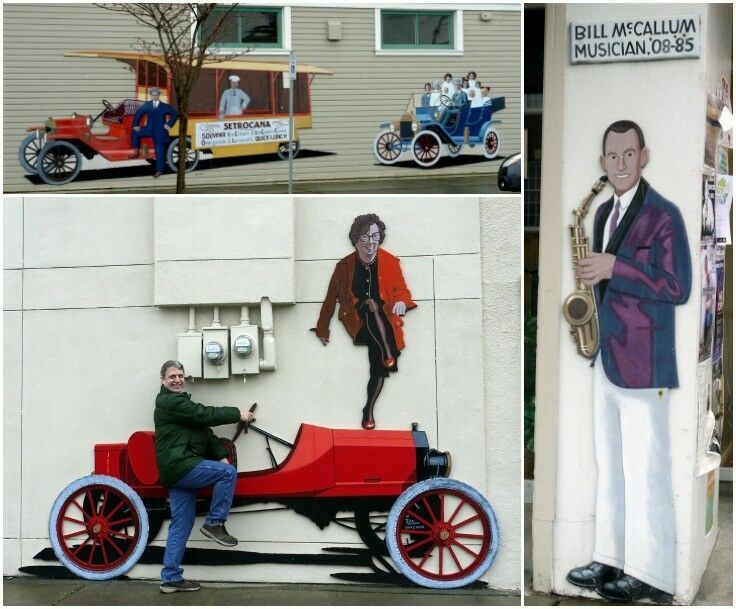 These murals make up what is known as the Anacortes Mural Project and are created by artist and historian Bill Mitchell, a lifelong Anacortes resident. Confined to a wheelchair, Mitchell began painting murals in 1984, and the count now numbers more than 150. 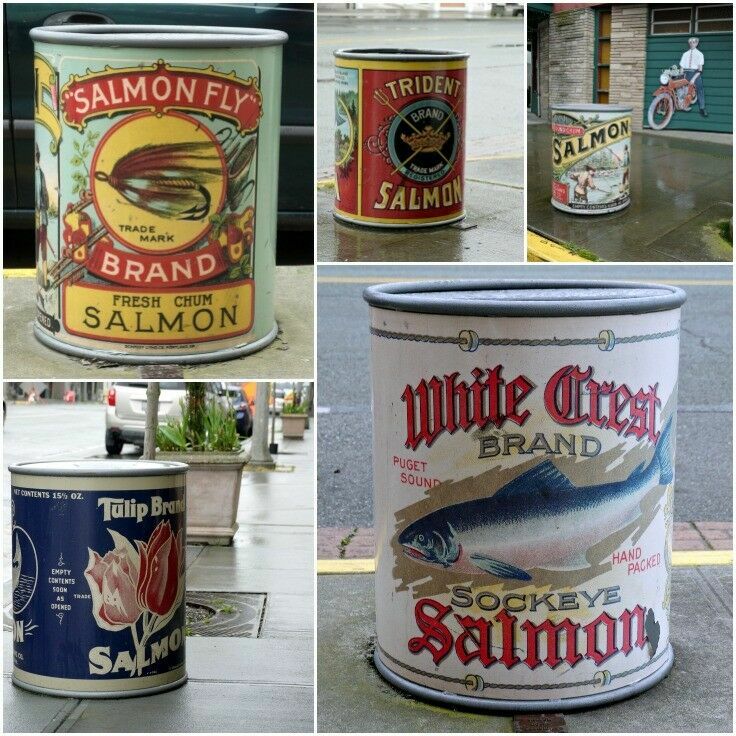 Along Commercial Avenue and down on the waterfront, you will also see a number of colorful cans featuring historic salmon label art from the Puget Sound fishing and canning industry. The salmon can project is the result of a city and community effort inspired by… Guess who? That’s right – the aforementioned artist, Bill Mitchell! 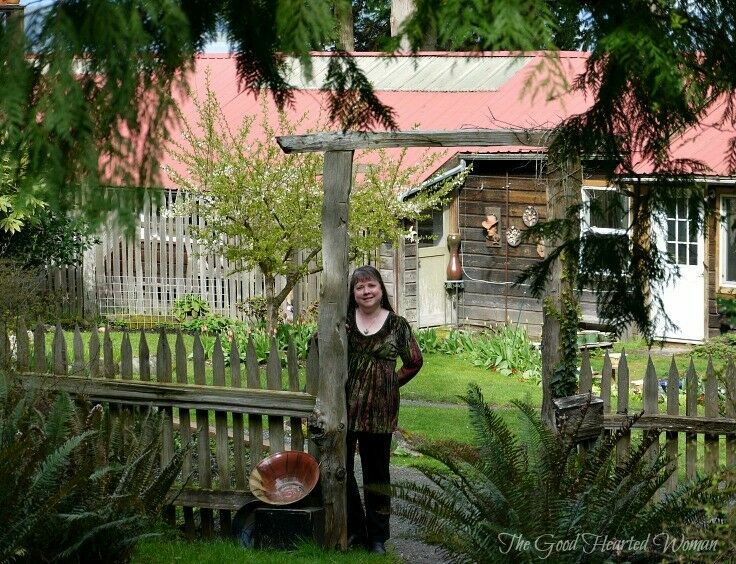 It seems that Historic Anacortes owes a great deal to this talented and dedicated artist. The sidewalk salmon cans recall Anacortes incredible fish-packing past. The first cannery in Anacortes opened in 1893 and by 1915, eleven canneries were operating in town. Most canneries packed salmon, but cod, tuna, clams, oysters, crab and even fruit and vegetables were also canned there. There are a number of wonderful shops in Anacortes, including a a well-stocked quilt shop, an amazing historical marine supply store, and one of my personal favorites, Elisabeth’s Cottage by the Sea. It was this window display – and Audrey Hepburn – that drew me in, but we soon found out that there was much more to Elisabeth’s besides beading supplies. A visit to Elisabeth’s Cottage by the Sea is a little like a treasure hunt. You will find a myriad of remarkable items, including jewelry (both vintage and new), antiques, nautical items, and cabin décor. 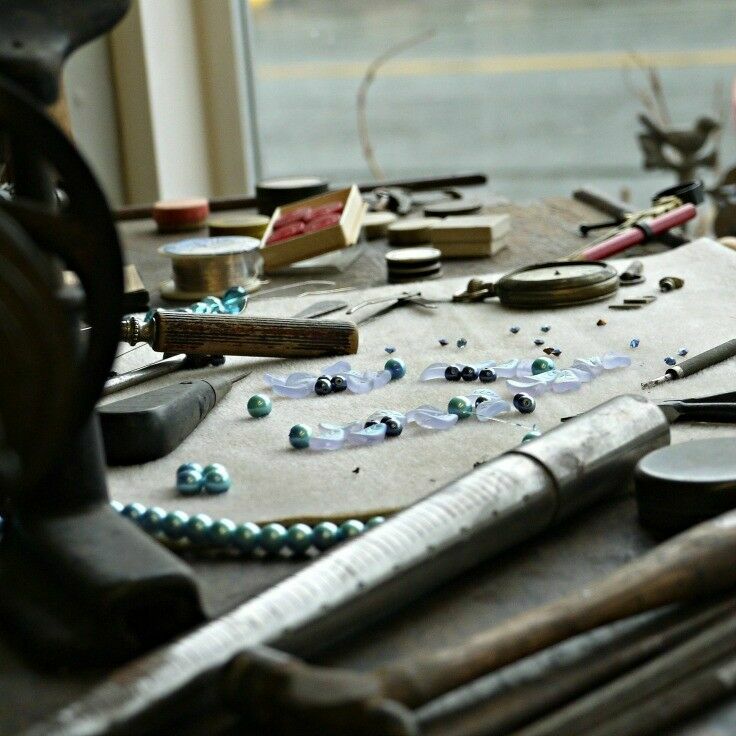 They also offer jewelry making classes, including silversmithing, stone-cutting, inlay, and soldering. Did I mention that they also house the largest turquoise carving in the world? 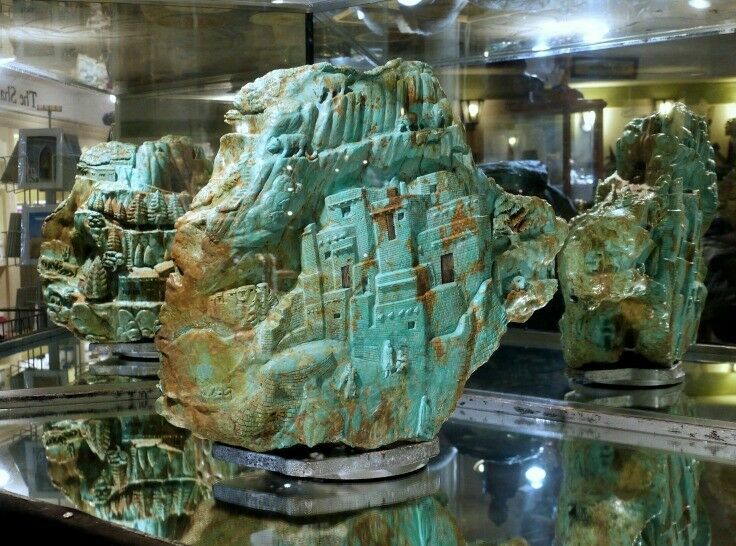 Valued at $1,800,000, this 121 pound turquoise carving is the largest of its kind in the world. Before catching the ferry, we stopped at Adrift for a bite to eat. Adrift’s menu features locally sourced meats, seafood and produce, and the place was packed midday Sunday, with every plate that passed by smelling marvelous. I believe they may also have the best tag-line for a restaurant that I’ve seen so far: ADRIFT – Swell Food for Salty Dogs. Love it! We cut ourselves a little short on time, so we had to forego ordering off their brunch menu (which looked Amazing, by the way! ) and went with simple a cup of soup and homemade dark rye bread. Both my Moroccan chickpea soup and Mr B’s tomato bisque were deliciously hearty, well-seasoned, and very satisfying, and the soft, pillowy bread arrived warm from the oven. 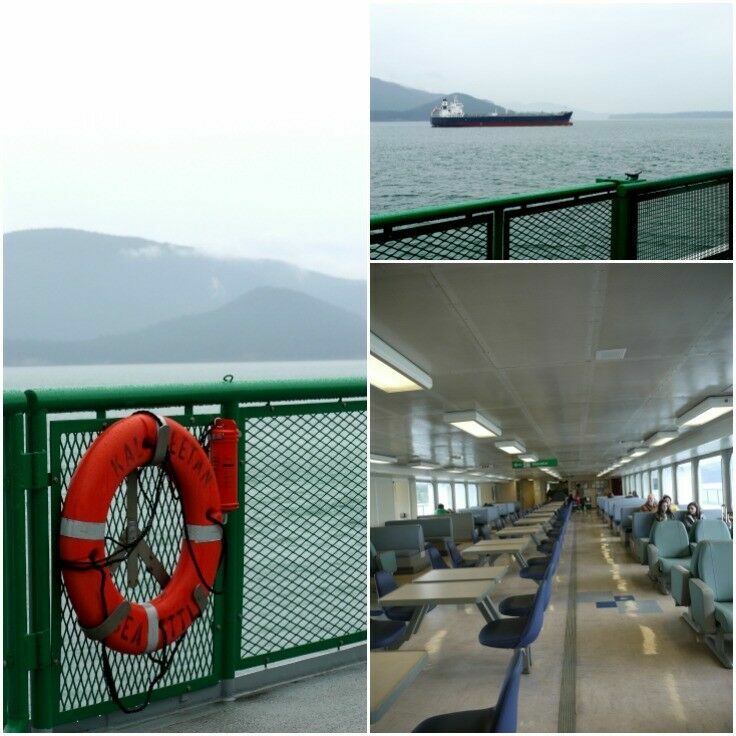 The Washington State Ferry bound for Orcas Island departs a number of times each day from Anacortes. Washington State Ferries offer more than a dozen sailings to the San Juan Islands each day, but not every ferry stops at every island, so pay careful attention to the ferry schedule, which changes seasonally. If you plan to bring your car on the ferry, it is strongly recommended that you make a reservation for both your trip to Orcas and your return to Anacortes. (Walk-on passengers don’t require reservations.) There is no charge to make a reservation, although if you don’t show up, you will incur a small penalty charge. The ferry trip takes about an hour and twenty minutes, and there is plenty to see along the way. (I like to pretend that we’re on a mini-cruise!) 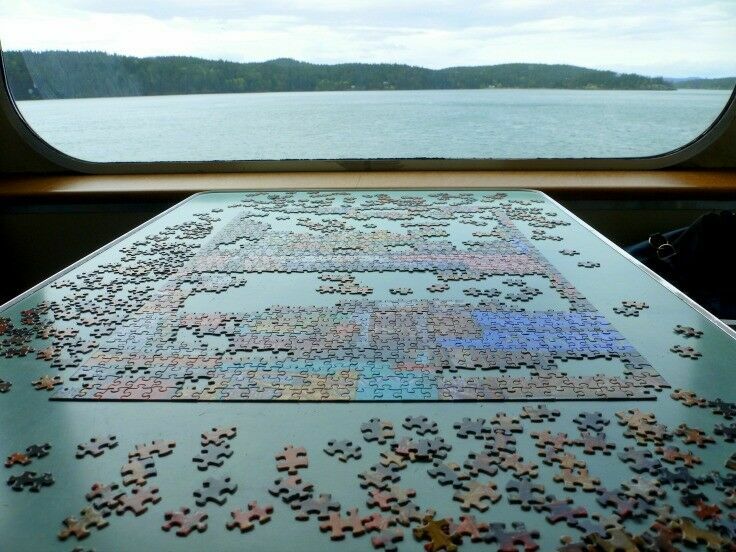 You can often find puzzles out on one of the decks, and travelers can pass time piecing them together. Mr B and I have done this many times, but we have yet to be the ones to “finish” the puzzle. Once you arrive on Orcas Island, the ferry unloads very quickly, and you are ready for the next leg in your island adventure! 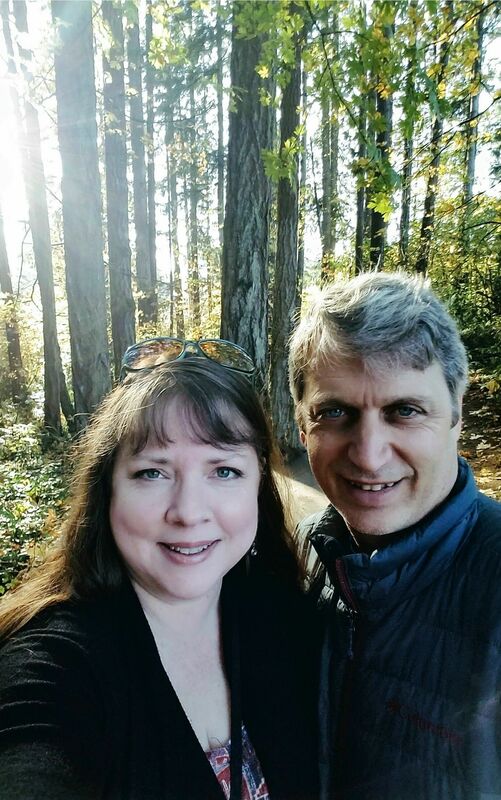 Last week, Mr B and I took the most peaceful, relaxing, inspiring vacation ever – to Orcas Island. We loved it so much that we almost didn’t come home. Orcas Island is the largest of the San Juan Islands, located off the northern coast of Washington State. Just over an hour by ferry from the mainland city of Anacortes, Orcas is a Pacific NW vacation paradise. 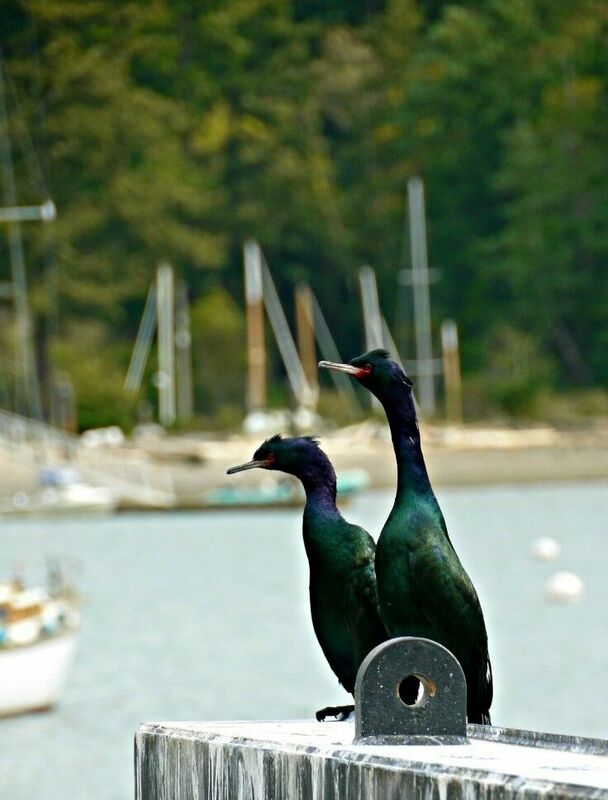 These two cormorants were part of the meet-n-greet committee at the Orcas Island Ferry Pier. 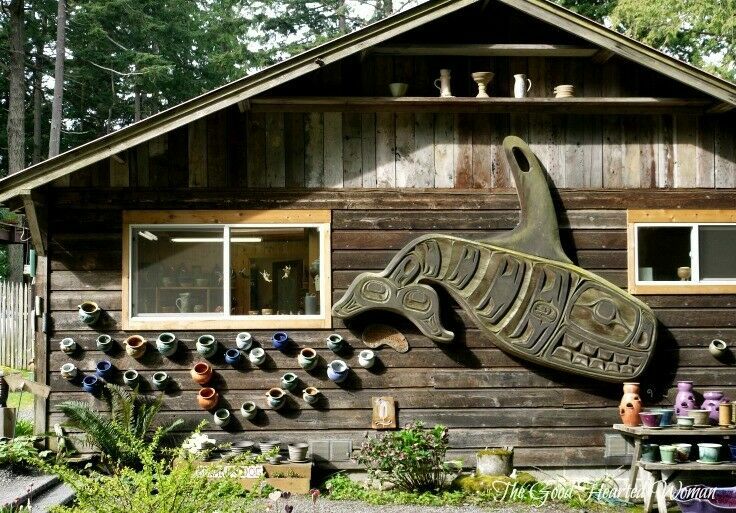 Orcas Island has a thriving community of artisans that throws open doors of welcome to visitors in studios, shops and galleries all over the island. You can spend hours just looking at (or in my case, touching) (or trying not to touch, as the situation warrants) beautiful hand-created pieces of fabulous and functional art. We especially enjoyed all the beautiful pottery. 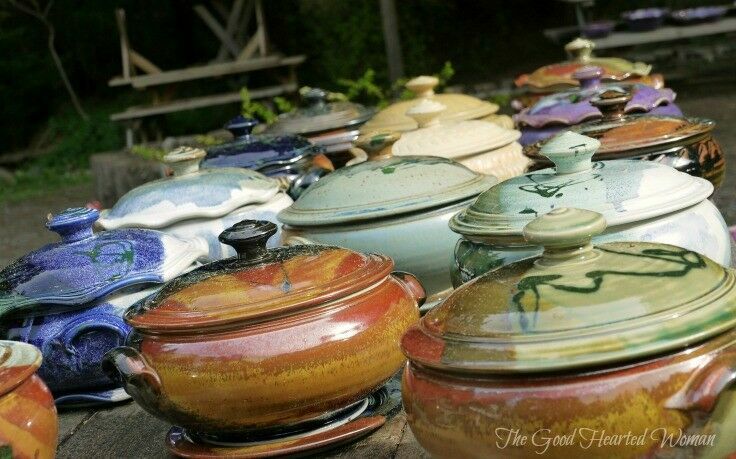 A picnic table loaded with Steamer Pots at Orcas Island Pottery. The folks on Orcas Island do not mess around when it comes to creating beautiful, delicious food. We ate often and well. Orcas Island offers a multitude of outdoor sports for the active vacationers. It was a little too chilly this March for swimming, but lots of other activities were definitely accessible, including camping, boating, climbing, hiking, bicycling, and our favorite – kayaking. You can bring your own gear, or borrow from one of a handful of rental places that freckle the island. Day tours are available through several local companies as well. Above all else, it was the tranquility of the island experience that captured our hearts. The landscape is idyllic and inspiring, with open fields and farmhouses inland, wooded countryside, and amazing, sweeping vistas. It is, in a word, bliss. 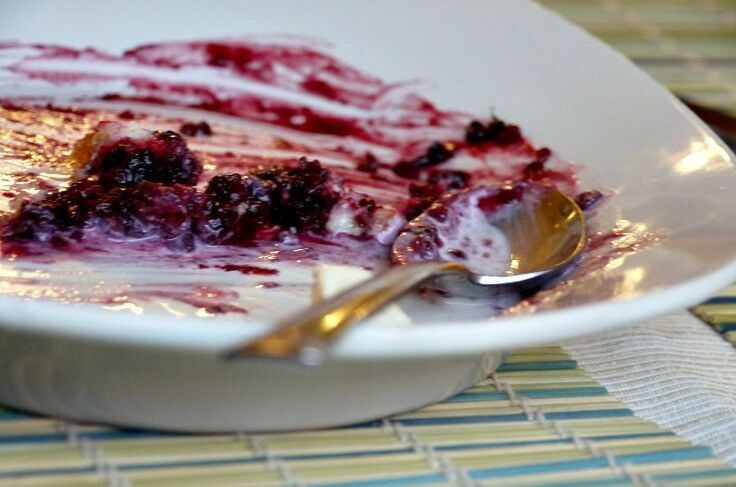 I’ll be featuring Orcas Island food, recipes, destinations and art in upcoming posts, so be sure to stay tuned!